Ultimate summer music festival and beer tasting experience in Northeast Missouri. Folk, Blues, Bluegrass, Classic Rock and the 4th Annual HAHA Brew Club's Home Brew Competition! BSMF is also very excited to welcome Vintage VW Owners from all over the Midwest to the Mark Twain Cave and Campground for our "Vintage VW Meet-Up!” Food and other exhibitors will be announced close to the event. 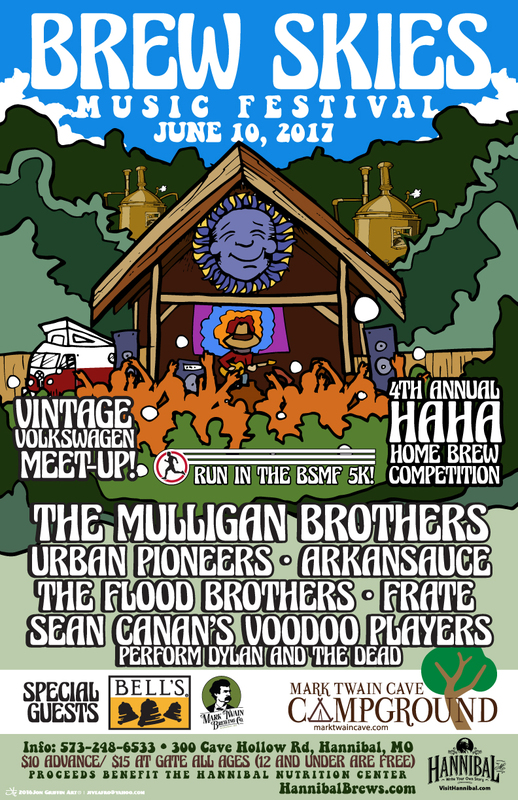 The Brew Skies Music Festival's "VW Meet Up" will likely bring back fond memories for several generations. Join us for this one-of-a-kind event in our area, on the grounds of the Mark Twain Cave and Campgrounds! 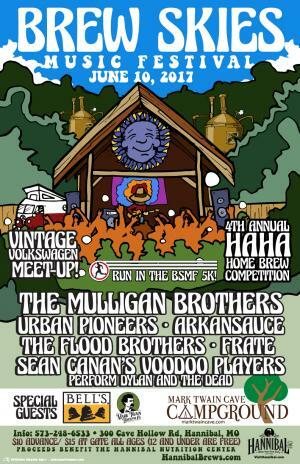 Check out the best of air and water cooled Volkswagens and enjoy live music, delicious food and fresh home brews from the Hannibal Area Homebrew Association at this large VW meet-up! This is an informal, non-judged gathering, held rain or shine. Don't own a VW? You're welcome too! Come enjoy a full day of live music, food, a wide variety of exhibitors, and all other Mark Twain Cave amenities. More than 50 vehicles from 8 different states have confirmed to be in attendance so far. Microbuses, Beetles, Thing, Sand Rails, and more. Learn how to brew your own beer at the 4th Annual Hannibal Area Homebrewer's Association Home Brew Competition. Home brewers come from all over the Midwest to compete in this annual competition which is organized by our local home brewing community. Guests get to sample beer recipes with origins from all over the globe that date back to the 1500's as the brewers compete for big prizes and braggin' rights! Competition will include a “People’s Choice” winner and a “Judge’s Choice” winner selected by our team of special guest craft brewers from Bell’s Brewery in Kalamazoo, MI and our local brewery team, Mark Twain Brewing Co.. The Brewer’s Association ranks Bell’s Brewery as the #7 independent craft brewery in the United States, and the winner of the Judges Choice in this competition wins a trip for two to the brewery in Michigan. Additional prizes awarded for 2nd and 3rd place. Mix and mingle with our professional brewers and share your opinions on these unique craft brews. Beer tasting is included in your general admission ticket cost. KIDS AGES 12 and UNDER are FREE! This is an all ages festival and all entertainment is family friendly. Kids activities include petting zoo, kids VW painting experience, pictures with Herbie, and many kid friendly vendors (caricatures, face painting, etc). The BSMF 5k run is the only exclusion from your general admission ticket price since the3re are t-shirts, medals and more included in that activity. To book your campsite, please call the Mark Twain Cave and Campground at 573-221-1656 for reservations. If you are looking for hotels, we would recommend our hospitality partners at Best Western on the Riverfront and Holiday Inn Express in Hannibal.